Dogs Trust: Ducks for Dogs: Join the Great British Duck Race! Ducks for Dogs: Join the Great British Duck Race! 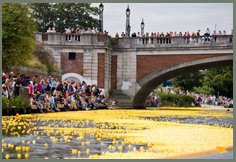 The Great British Duck Race organisers are hoping to release a quarter of a million yellow rubber duckies down the water at Molesey Lock, near Hampton Court Palace. The winner of the race is up for a £10,000 prize, and anyone can 'adopt' a duck for just £2, with proceeds going to charity. The £2 donation goes to WaterAid, The Down's Syndrome Association and NSPCC but if you make a larger donation you can choose from a list of additional charities, including Dogs Trust! The race is on Sunday 31st August, and don't worry - there's an environmental policy ensuring no duck remains in the water to affect wildlife and everything is fully recyclable.